Includes QR code Previous edition: published as by Greg Benchwick, Paul Smith. 2013. Text on inside cover. 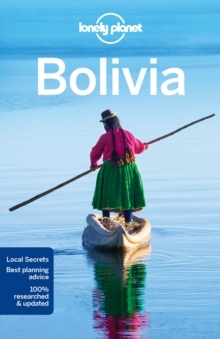 Lonely Planet: The world's leading travel guide publisher Lonely Planet Bolivia is your passport to the most relevant, up-to-date advice on what to see and skip, and what hidden discoveries await you. Tour the world's largest salt flat, walk in the path of the Inca or search for magic potions in La Paz markets; all with your trusted travel companion. Over 40 maps Covers La Paz, Lake Titicaca, the Yungas, the Cordilleras, the Southern Altiplano, Salar de Uyuni, Cochabamba, Potosi, Santa Cruz, the Amazon Basin and more The Perfect Choice: Lonely Planet Bolivia , our most comprehensive guide to Bolivia, is perfect for both exploring top sights and taking roads less travelled.